There is the sound of iron under the hammer in Murray Bridge in 2016. 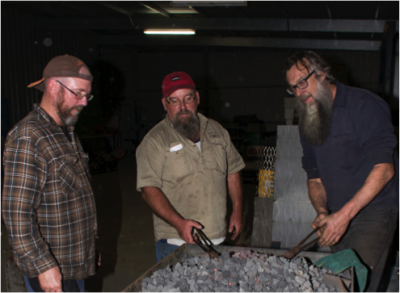 Once a month, ABASA member and Vice President – Andrew Hood, travels to the Bridge to hold a blacksmith forging session with an enthusiastic group of locals. 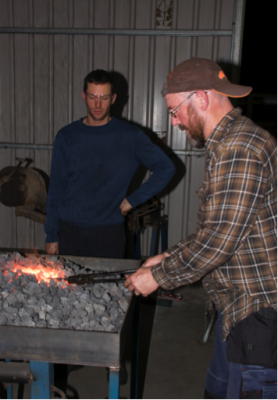 Some time ago, Rob Hughes, owner of Hughes Engineering, and his close friend Mal, got well and truly bitten by the blacksmith bug and decided to get the ball rolling on establishing their own forge. The guys have a modest collection of forging gear, and with some assistance from Andrew, have taken their first steps on the road to forging nirvana. Andrew makes the trip up to the Bridge once a month, with a collection of forging gear, to pass on his knowledge of forging to the group. 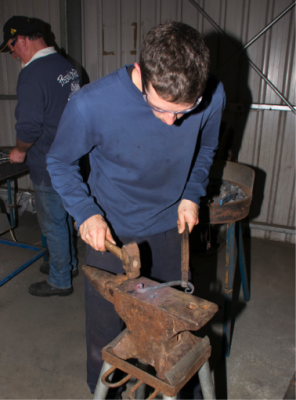 Andrew is teaching the basics of blacksmithing, similar in structure to that taught at Penfield. 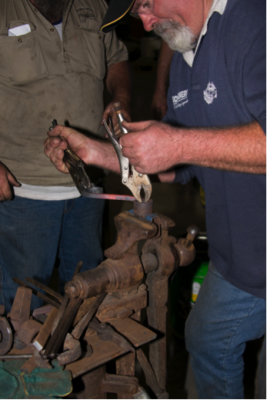 The basics of forging include drawing down, upsetting, twisting, punching and drifting, scroll forging and even collaring and riveting. Jen and myself appeared briefly at one of the workshops and were pretty impressed with the skills being demonstrated by the group after such a short time. Andrew has plenty of experience in all of the moves and doesn’t hold back in having a go at the seemingly impossible around the anvil. Rob is keen to incorporate the group as a chapter of ABASA and we are working our way to that goal. 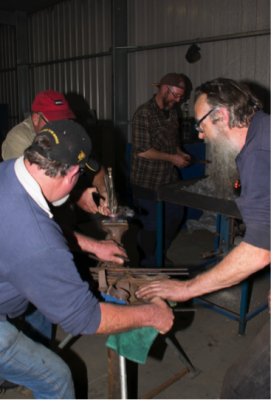 The interest in blacksmithing is very strong in the area and I have personally received a lot of enquiries from the public at the events we have attended in the local area, including Mannum. If our (ABASA ) past history is anything to go by, I believe the Murray Bridge group will grow in size at a rapid rate, once the word gets around. We wish Rob and Mal all the best and are ready to help them out in establishing a new group at the Bridge.